Seamlessly transforming a large and immense desktop website with an ever-growing collection of content into an equatable user experience on the small screen is no easy feat. However, as the mobile web and its users continue to grow at an unprecedented rate a mobile version of your website is essential. But where to begin? 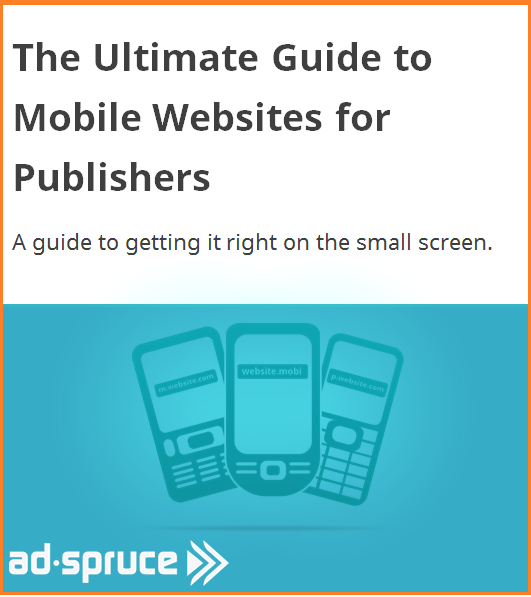 In the Ultimate Mobile Website Guide for Publishers 2014 we set you on the road to mobile success. This guide will help inspire designs, develop ideas and diminish construction errors to ensure your mobile website looks and performs like it should do to maintain followers and reach ad revenue targets. 1. Add new content daily. If you want your followers to visit everyday, then you need to upload fresh content that will make visitors want to keep coming back. If the focus of your website is more “ever green” content (content which is still relevant for weeks, months, years to come), then the addition of content to your site on a weekly basis is more realistic and sustainable. 2. Ensure content is “snackable”. Mobile web users tend to use their devices as a diversion when they have a few spare moments (normally in waiting rooms, on lunch breaks or on public transport). Your content should be able to be consumed in these short frames of time. Accessing long-form content on mobile devices is not only frustrating for users who want to finish reading an article or watching a video but also because users are still extremely conscious about data usage and how large videos, photos albums and articles will eat into their monthly data allowance. 3. Ensure users can navigate your mobile website easily. Make your homepage a menu and think about the end goals of the user – where do they want to be on your site? Try to put as few barriers as possible between the user and their desired page on your website. 4. Use Google Analytics to determine which devices are being used to access your website. Focus on developing your website with the dimensions of these screen sizes in mind. Also think about the operating systems and software that these devices use. Remember to also think about why your website is less popular with other devices – could it be because the users of these devices are experiencing bugs when they visit your website? 5. Make your content shareable. Ensure that you add social sharing features to each piece of content you publish. This makes it easier for users to share a particular photo, video or article on your site. Social sharing should be made as easy as possible. It’s also a good idea when writing titles for your content to think “Would someone share this title on their social media?”. If the answer is no, it’s best to readjust the title. 6. It’s a good idea to have a more refined site map for your mobile website. Cut down on unnecessary pages and think about whether the pages you plan to keep need to be restructured for mobile. On the subject of site maps – it’s good practice to also have a site map for images and videos too. 7. App installation ads. Whilst you may want to drive your app downloads, don’t force your visitors to this option. One pop up banner with the question “Would you like to try our app?” with “Yes” or “No” button is understandable, but when as a user you’re not given any other choice, it can be frustrating. Users who wants to access your content quickly and without downloading an app are likely to navigate away from your site entirely and visit another comparable website. 8. Your frequent site visitors may be more familiar with your desktop site layout, and so when they want to complete an action quickly on your website, they may prefer to use the desktop version but on their mobile device. Think about adding this option in as part of you homepage menu on your mobile site. However, if users keep selecting to use the desktop version of your website you should evaluate if the mobile version is delivering on its usability. 9. You need to brand your mobile website – that much is clear. But you also need to consider that when viewing on a mobile device, screen size is significantly smaller and the colours you use for your background and font need to clearly contrast one another to ensure that text is easy to read. It’s also important that you choose a clearly legible font that can still be read even when viewing on a much smaller scale. 10. Test, test and test again. Get everyone you can involved with testing your website to ensure that it works efficiently across different devices, browsers and operating systems. Set up a list of actions and design points for your tester to check and also create a group document where the testers can report their findings. Mobile Awesomeness is packed with inspiration and great ideas for designing mobile websites. If you’re thinking of using responsive design, Mashable have created this comprehensive guide to responsive website design. Speaking of responsive mobile website design – here are some particularly creative examples. Flat mobile web design is a big trend right now. This article from Hongkiat has some impressive designs that will inspire you. The user experience for mobile web users is of utmost importance, which is why you should read this list of 10 tips on improving usability (also from Hongkiat). The writers at Hongkiat are on hand again to show you 20 mobile user interface designs that will impress any visitors to your site. Here’s an informative blog article about creating a secure mobile website. If you want to know some of the most common mobile website design bugs, then you’ll find this blog remarkably helpful. The author has compiled the most common mobile website errors and bugs from the past two years into one complete guide. If you’re wondering what your current or new website will look like on different mobile devices, you’ll find this tool from HubSpot useful. It’s called the HubSpot Device Lab and it shows you your website in the frame of several popular devices such as iPhones, iPads and more. To keep your mobile website design free from clutter, put all your social sharing options all under one button using the AddThis tool. You’ll likely have seen the AddThis tool on many mobile websites already, it’s become something of a standard and so it will be familiar to your users. First and foremost you’ll need to research the mobile audience. This infographic created by SuperMonitoring provides a wealth of information on the usage of the mobile web including the most popular browsers, devices and operating systems. On the topic of conducting research, Google has developed a comprehensive research centre which allows you to produce custom reports based on your criteria selections. The research is called Our Mobile Planet and you can find it here. If you want to test how your site’s SEO performs on different mobile operating systems, platforms and more, this tool from Mobile Moxie provides a simple overview of information which you can use as a checklist to improve the SEO of your mobile website. Google webmaster shows you how important aspects of your mobile website are performing in search, any crawl errors, site errors or url errors which need to be fixed. If you’re not using it already to promote your website, then Google+ is your next marketing stop. It has become not only a social network but a powerful tool for boosting the SEO of your blog and website. Ensure the authors of your blog have a Google+ profile set up and they have linked their profile as a contributing author to your blog. SEO is becoming more social and so your company writers need to establish themselves as an authority on a topic or industry. Building followers on Google+ and ensuring the information that they share receives lots of engagement such as comments, shares and +1’s signals to Google that the information they are sharing is noteworthy and interesting to other web users – which will raise articles written by them in search engine rankings on their professed knowledge topic. Google Analytics will help you to establish where your website traffic is coming from. It will also enable you to mark events on your website traffic history such as notable increases or decreases in traffic and the reasons for them. These annotations can help you mark events such as a PPC advertising campaign, if your website was down for any particular reason, a launch of a new product or the distribution of a press release. This allows you to give context to the data and identify trends in your traffic when you analyse it. Moz are experts in SEO. They’ve compiled a handy checklist into a blog post which you can use to ensure you’ve ticked all the boxes for optimising your mobile website. Everyone loves content that can be shared and right now one of the most popular forms of content are gifs. Create your own original gifs by using this handy tool and then post them to your website. When your users share them it will increase links back to your site. Curate content to add to your site using Feedly. Find out what people are talking about right now and determine how you can relate it to content on your website to drive traffic. Use a social management platform such as HootSuite. Every time you post a link to your site through the dashboard, use the URL shortening tool to create a custom URL. You can then track the number of clicks you had from each URL that you’ve posted so that you can determine which links drove the most traffic and then create more tweets and content like those which drove the most visitors to your site. AdSpruce specialises in monetising mobile websites just like yours. Not only do we work with media-rich ad formats like video, but we also provide unique technology that allows us to monetise not only smartphone traffic to your website but feature phone traffic too – unlocking new revenue streams for your business. To find out more about our SDK you can visit the publisher section of our website here. To learn more about our advertising formats visit our page for advertisers here. We hope you found this guide helpful, if you have any of your own mobile web design tips you’d like to share, feel free to write them in the comments box below.